Feature and Follow Friday (1) TV show or Movie? 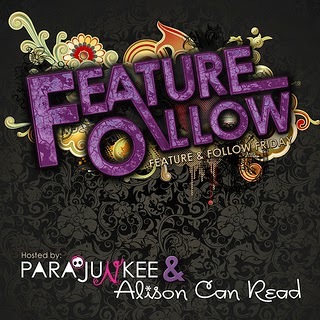 This is my first time participating in Feature and Follow Friday, a meme hosted by Parajunkee and Alison Can Read. The idea is to make friends and gain new followers, as well as discovering some awesome new blogs to follow yourself. Each week one blog is showcased and this week’s Featured Blog is Blue Books and Butterflies. It’s required to follow the Featured Blog as well as the host blogs. Be sure to check out the rules if you want to join in. There’s also a different question posed to the bloggers each week. Question of the Week: Which book/series do you think would make a better TV show than a movie? I recently finished reading Time Riders by Alex Scarrow and I think this would make a great TV series. It’s a YA sci-fi adventure series all about a team of young people that travel through time correcting alterations in history. The 9th book, The Infinity Cage, is coming out on the 9th November in the UK. You can find out more about the series here. I think it would make a good TV show because it’s quite action-packed and there are almost infinite possibilities for new adventures. It has the potential to be a great sci-fi show along the same lines as Dr Who. « Copycat Covers-Who wore it best? I haven't heard of this series but I LOVE time traveling sci fi stories. I'm checking this out! I love time travel stories, so I'd be up for that. I just checked out your Tumblr, and we have SO many mutual loves in common! Star Trek, BUFFY!! !, Harry Potter, Johnny Depp! We'll have a ton to talk about, lol! This sounds like it would make awesome T.V. 🙂 Following you back! I'm not familiar with those books, but looks like they would be good. Thanks for stopping by. I'm following you via Feedly. I haven't heard of this one yet, but it sounds good, Tizzy. Thanks for stopping by earlier 🙂 Happy reading. Following back on Blog Lovin. Thanks for stopping by! Sounds like a good book series, and a great possibility to be a TV series! New Bloglovin follower! Thanks for stopping by! Happy reading! The Time Riders books are so good! They would make great TV shows. I have followed you back via GFC, thanks for visiting my blog! Thanks for dropping by my blog! New follower! I haven't even heard of this series, but it does sound really good. It sounds like a TV show I would definitely check out. I haven't read this series yet! But from what you describe, I think it would DEFINITELY do better as a TV show. Especially because there are so many of them. It would really give the writers more of an opportunity to focus on all of the details in the story. That would be a good one. I'm a new follower.